The phishing threat landscape has changed. 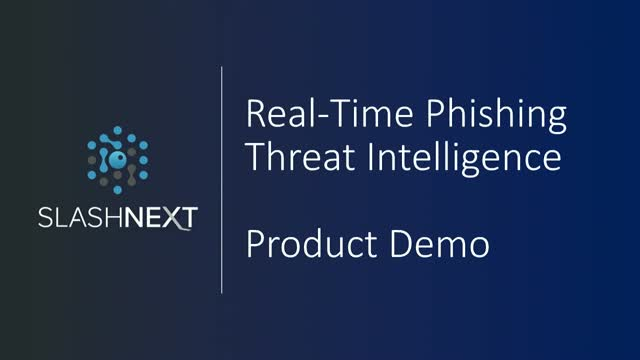 Stay ahead of zero-hour threats with real-time threat intelligence and targeted phishing defense. On this channel, you will learn techniques, tactics, and procedures for the new generation of evasive phishing threats and what's required for modern phishing threat detection. Mark McDaniel, Senior Director of Technical Services at SlashNext, Inc. Threat intelligence that covers new types of phishing threats is essential for understanding and defending against previously unknown zero-hour threats. Slashnext’s behavioral analysis approach that leverages our Session Emulation and Environment Reconnaissance™ (SEER) threat detection technology. Real-Time Phishing Threat Intelligence that is more automated by evaluating many more characteristics of the site, so it’s able to render a definitive verdict, malicious or benign. Threat actors are going after the human attack surface with new kinds of phishing and social engineering techniques, tactics, and procedures (TTPs). While credential stealing remains popular, new types of phishing and direct-to-browser attack vectors are evading existing multi-level security controls. Threat intelligence that covers new types of phishing threats is essential for understanding and defending against previously unknown zero-hour threats. Learn about new phishing attack vectors, fast-moving phishing sites, and how you can catch them. According to Verizon’s 2018 Data Breach Investigations Report, phishing attacks are at the start of over 90% of data breaches and financial losses. Today's phishing attacks employ short-lived sites, most lasting just 4-8 hours. And attack vectors are expanding beyond email to social media, IM, ads, pop-ups, rogue browser extensions, and more. New attack methods exploit the human attack surface within targeted organizations and evade existing security defenses by design. A noted security expert who has spent most of his career on the front lines of the war against cybercrime, Atif has worked with law enforcement and other global organizations to take down some of the world’s biggest malware networks. Atif is the former lead architect of FireEye’s core malware detection system and is the visionary behind SlashNext's innovative approach to real-time phishing site detection.